One of my favourite neighbourhoods in Rome is Rione Monti, located between the via Nazionale (which runs from piazza Repubblica to the Quirinale) and via Cavour (connecting Termini train station to the via dei Fori Imperiali). The area includes some of the major Roman sites such as the Trajan market and the forum of Augustus, and stretches all the way to the basilica of Santa Maria Maggiore. However, what we mean by Monti is the small neighbourhood between via Nazionale and via Cavour, where a creative community of dressmakers, alternative clothes designers and artists workshops can be found. Monti is the oldest area in Rome and the first neighbourhood created when the city got divided into different areas, called Rioni. During the Antiquity, it was known as the Suburra, the lower-class area of the city, and was overcrowded, insalubrious and prone to crime. It was emperor Augustus who reorganised the city after the collapse of the Republic and created the fourteen regiones that were to remain during the Empire. They then disappeared with the decline of Rome, but re-emerged in the Middle ages, when the Christian city started to expand again. They were once more redefined with clearer boundaries during the Renaissance, when the rioni had a strong identity and their own dialect, and were often at war with each others. 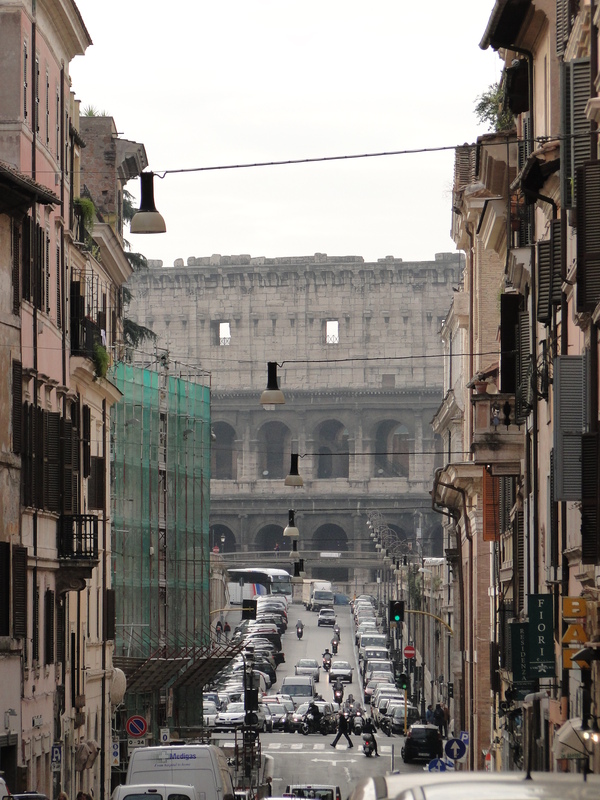 Monti was still a relatively poor and densely populated area, where Michelangelo happened to live in his time. The area was transformed and partly destroyed in the early 1930s when Mussolini decided to build the imposing via dei Fori Imperiali linking Piazza Venezia to the Colosseum, knocking down all the houses on the way. Whole blocks disappeared to make way for a wide avenue which, in Mussolini’s views, would reflect the greatness of the old empire as well as his modern fascist regime. Today, Monti’s main streets are via dei Serpenti, via del Boschetto and via Panisperna, which is famous for being on three of the seven hills, namely the Quirinale, the Viminale and the Esquilino. This is where all the alternative clothes shops and vintage boutiques can be found, which is one of the reasons why I like it. It brings a healthy change from the large and uniform shopping malls that have recently mushroomed on the outskirts of Rome. One of my favourite stores is Abito, which used to be a smaller boutique around the corner but which has recently expanded to become an open workshop where the owner-designer’s team is busy sewing, while customers try on outfits. Every season, they offer a made-to-measure collection, whereby customers can choose a pattern and a type of fabric and have a garment made to their own taste. With Abito, the whole concept of shopping has changed in the area. Customers are more like friends who pay regular visits to the workshop, maybe to just have a coffee and a chat or maybe to look for new clothes. Since it got established, another three boutiques have started offering a similar tailoring service. Partly because of that, Monti has kept its authentic feel and village atmosphere instead of turning into another overpriced tourist spot, although many residents fear this will eventually happen anyway. For now, the streets of Monti still have a life of their own. Via Panisperna also gave its name to a group of young nuclear physicists, the “boys of Panisperna”, led by Enrico Fermi. With their avant-garde research in nuclear physics in the late 1920s, the group brought international fame to the Italian Institute of Physics where they were working on via Panisperna (the building is today part of the Interior Ministry). More recently, veteran film director, Mario Monicelli (born 1915) gave an insight into Monti in his short film: vicino al Colosseo c’è Monti. Today, the centre of Rome counts 22 Rioni, which include Monti, Trevi, Campo Marzio, Esquilino, Trastevere, Testaccio, Celio amongst the largest ones. 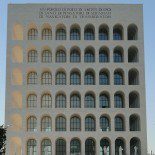 This entry was posted on November 16, 2010 by Salambo in Arts and culture, Daily life in Rome, English, Mussolini's Rome, Rome's neighbourhoods and tagged Colosseum, Michelangelo, Monicelli, Monti, Mussolini, ragazzi di panisperna, Roma, Rome, Suburra, Trajan markets, via dei Fori Imperiali, via Panisperna.